One of the things that we have started to incorporate into our daily routine is juicing. 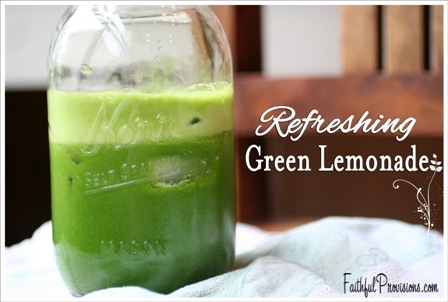 This is not the first time we have tried juicing recipes like this Green Lemonade recipe. I started juicing years ago, only to stop due to the cost and the amount of work associated with it. Even at that time, it was more of a novelty—the trendy thing to do. Since then, after lots of research and major lifestyle changes, I now greatly understand the importance of healthy, nutritious foods. Today, the cost of time and money doesn’t bother me as much because I see the benefits and consider it an investment. So when I’m juicing, I’m looking for recipes that have a little less fruit and a little more vegetables. Here is my absolute favorite juicing recipe that I drink in the morning for breakfast or as an afternoon pick me up. I used to drink coffee, but now I’m reaching for juice! all organic of course- no point in mainstreaming the poisons! we have a breville and really like it. I think that we stick with it more because it isn’t hard to clean. Have you considered the vitamix blender ? They have it on QVC with 5 monthly pmts. and they say it does as good as a juices. I have seen it demoed at Sam’s and they drop strawberries in tops and all etc.. and you can’t tell when you drink it. Can you juice and refergerate it for drinking later in the day or do you have to do a fresh batch each time you want something? I’ve read that drinking it immediately is best but within 24 hours for maximum nutrients. Cheryl, I have a vitamix also, but I use that for smoothies. It does “juice” technically, but it is a lot thicker than an actual juicer that removes all the remnants. I use both though! Does it matter which model Breville or does the $99 one from your link to amazon work well? I would hate to spend the money and not get a good reliable juicer. Please let me know which Brevile model is best. And can you make fruit smoothies in it too? I feeoze a lot of strawberries, blueberries and bananas. I have not used the Brevilles, but they came highly recommended. You can’t do a smoothie in a juicer, you need a blender for that. You can only put fresh produce in a juicing machine. Ooops. I meant “freeze” and thanks for the additional recipe Connie. Great recipe article, I would like to study my favorite. Where do you find ginger? Do most grocery stores have it?? You can find ginger root in the produce area, usually near mushrooms and jalapeno peppers, on the outsides. It looks like a gnarly root. I love your green juice recipe. Making fresh green juice is part of my daily routine. Can’t live without. Yum! Just tried the green lemonade one… delish! Kelly, thanks for sharing this recipe. I have been getting this juice from whole foods lately and it’s my new favorite although it’s really pricey. Can you email me a link to more recipes if possible? Really wanna start juicing regularly. Thanks!! Rob, I’m glad you like it! Have you tried my Fresh Strawberry Juice recipe? It’s delicious!